Singapore has long been a hotbed for startups in Southeast Asia, often leading the pack in new ways to use tech in the region. Healthtech is one of the newest sectors in the city-state, but it has already drawn hefty investment and plenty of interest. For one, the Singaporean government has allocated S$4 billion (US$2.95 billion) for research and development in health and biomedical sciences for the period spanning 2016 to 2020. And in the first half of last year, US$16 million worth of healthtech deals took place in Singapore, according to a report produced by Galen Growth Asia. In the past year, an array of healthtech services have surfaced in Singapore, from telehealth apps that connect patients with doctors, to systems that use artificial intelligence to generate insights about certain medical conditions. Here are five Singapore-based healthtech startups that are using technology to overcome systematic inefficiencies within the healthcare industry. Bryan Koh, the founder of WhiteCoat, told to KrASIA that he found it difficult to peel away from his legal practice to visit a clinic whenever he had fallen ill, so he set out to simplify the process of locating a physician and cut down the waiting time for patients who weren’t suffering with serious medical conditions. 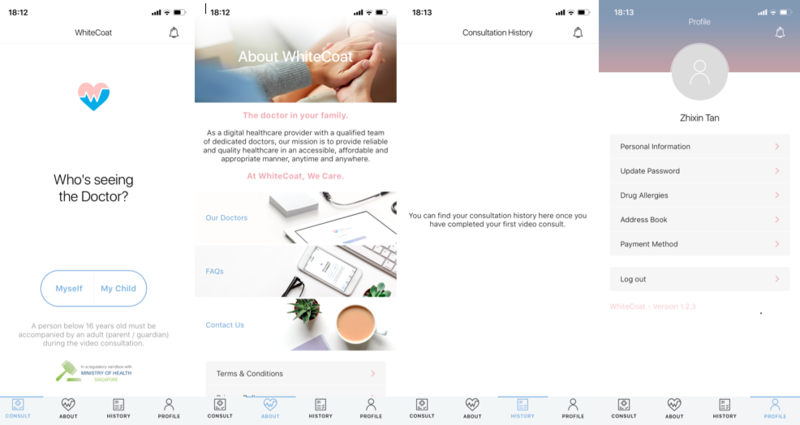 Established in 2018, WhiteCoat is a digital healthcare provider that offers video consultations via a mobile platform. It is particularly helpful for those with restricted mobility. Where appropriate, WhiteCoat’s in-house doctors can prescribe medications, medical certificates, or referral letters through the company’s app. OurHealthMate was founded on the understanding that many families in India have healthcare needs that are taken care of by relatives living overseas. With a vibrant Indian community in Singapore, it made sense to develop a way for them to keep up with medical care for their extended family members in South Asia. 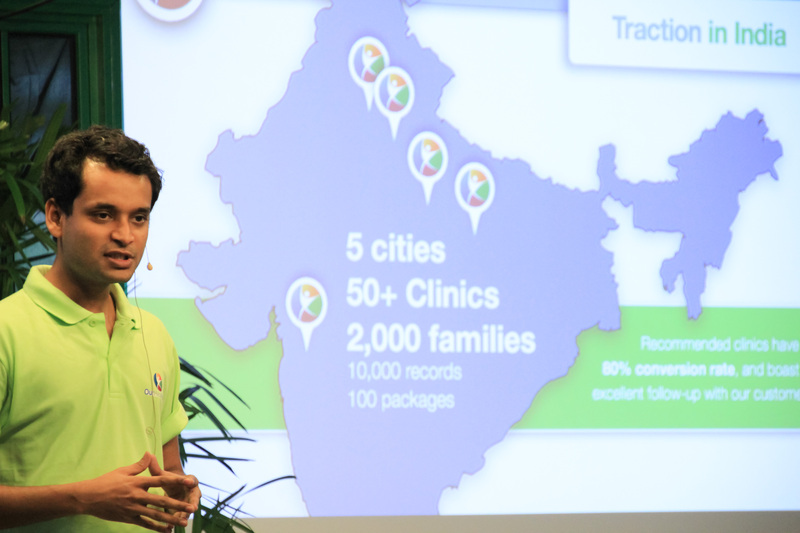 Founded in 2013 by a team of Indian expatriates living in Singapore, OurHealthMate helps Indian expatriates around the world manage their families’ medical appointments in India. It is an online healthcare marketplace where users can assist their family members with finding doctors, making appointments for check-ups, arranging consultations, and making payments. All the family member has to do is to show up at the clinic. MyDoc was founded by doctors at a time when there was no centralised system to aggregate healthcare data, making it difficult for doctors to track developments of certain medical cases over long periods of time. The company started out as a platform that manages healthcare data. Today, MyDoc offers a well-rounded package for patients seeking healthcare services. 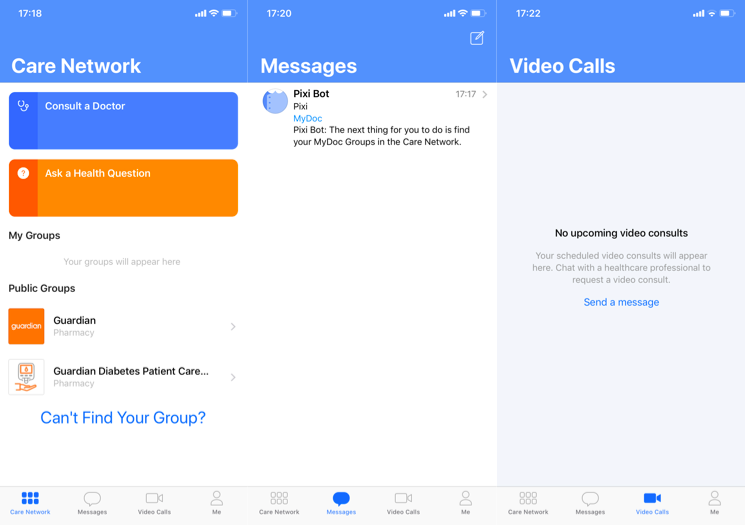 It includes a messaging system to communicate with doctors, video consultations, healthcare data-tracking, digital health screenings, and a prescription service. The goal is to simplify outpatient care and eliminate delays at traditional healthcare facilities. MyDoc recently formed a joint venture with American conglomerate UST Global to address employee healthcare in India; in September 2017, it raised US$5.2 million in a Series A round led by UST Global. It also launched and trained the first telemedicine course for the Singapore Medical Association’s continuing medical education curriculum in April 2018. Let’s face it: some patients don’t make the best decisions for themselves when it comes to medical care. DocDoc was established after Grace Park and Cole Sirucek, the company’s founders, went through a personal ordeal: they were told that their daughter had to undergo immediate liver surgery, but the physician was unwilling to provide his qualifications. The couple ended up reaching out through their personal network to quickly locate a surgeon they could trust. Using that episode as a reference, the company utilises artificial intelligence to help patients find the right doctor for the right problem at the right time, and the platform ensures that the process is transparent. Already, DocDoc has a network of 23,000 doctors plus 739 hospitals and clinics—the largest in Asia. At the moment, the service is only available to a limited pool of patients who are covered by insurance firms. In March 2018, DocDoc raised US$5.5 million in a Series B round led by Adamas Finance Asia. Photo credit: Healint’s Migraine Buddy app. Sometimes, patients who visit a doctor for a chronic pain condition are unable to recall details of the attack. Healint records the relevant information for patients, physicians, and researchers to improve treatment outcomes and expedite clinical trials. 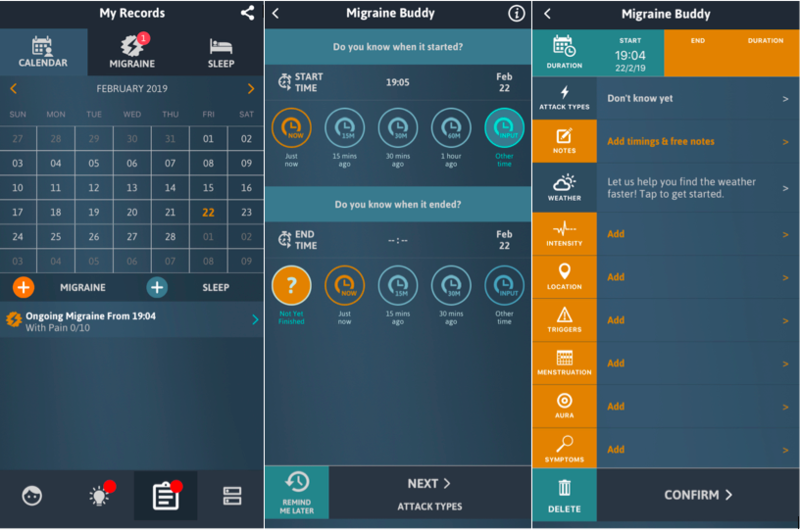 One of its most successful products is Migraine Buddy, a mobile app designed by neurologists and data scientists. It stands out compared to similar applications in that it uses sensor readings from mobile phones, external data sources, and additional user input to help patients track and record their conditions. Doctors can then use the data as a reference during checkups. Migraine Buddy is the most popular condition-specific app in the world. Healint’s investors include GREE Ventures, Partech Ventures, and Wavemaker Partners. The healthcare industry is recognised as one of the slowest to digitalise. However, the pace has been picking up over the past few years, and governmental support is crucial for the healthcare industry’s transformation. Singaporean officials have been funneling resources toward the healthtech sector to develop an environment where companies can improve the user experience of the city-state’s medical care. One state-backed initiative is a regulatory sandbox called the Licensing Experimentation and Adaptation Programme (LEAP), which launched in 2018. 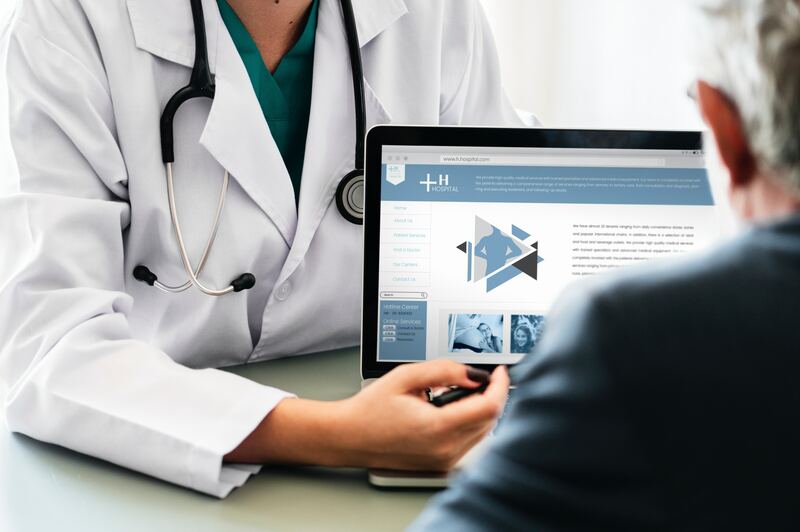 LEAP works with various telemedicine providers to encourage innovation, and at the same time is shaping the laws that will govern this relatively new form of service. Meanwhile, Singapore Management University has formulated the curriculum for a new second major in health economics and management to train the personnel needed for a robust, modern healthcare sector. The courses cover data analytics in healthcare, smart healthcare in Asia, healthcare management, and more. For those entering the sector, things look rosy. Investments in the healthtech industry have grown by 7% from 2015 to 2018, and that number is expected to nearly double by 2021, according to Bruce Liang, who is the chief information officer at Singapore’s Ministry of Health and chief executive officer of Integrated Health Information Systems (IHiS). Huge companies also see the potential of this market and are setting up offices in Singapore. For instance, Galen Growth Asia, an advisory firm for healthtech startups and investors, recently set up its regional headquarters in the island-city. The potential for growth for Singapore’s healthtech sector is huge. The city-state’s talent pool is growing, its government is supportive, and other complementary fields like artificial intelligence and fintech are booming. The healthtech sector might just help us live longer, healthier lives.